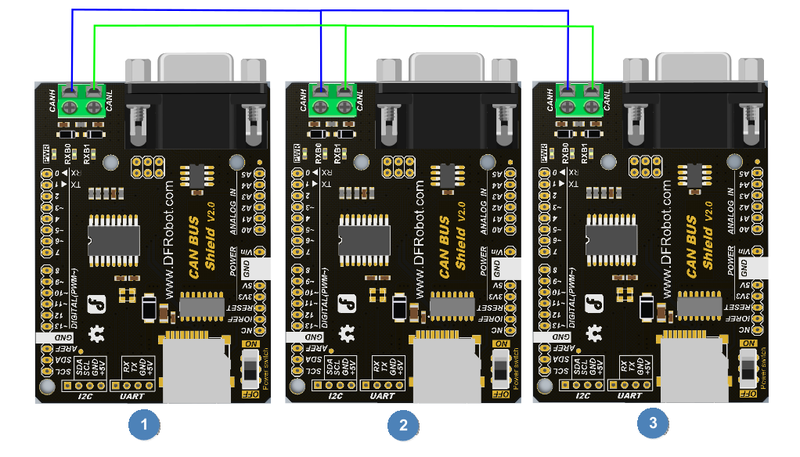 The CAN-BUS arduino shield v2.0 is designed for the Arduino Microcontroller. 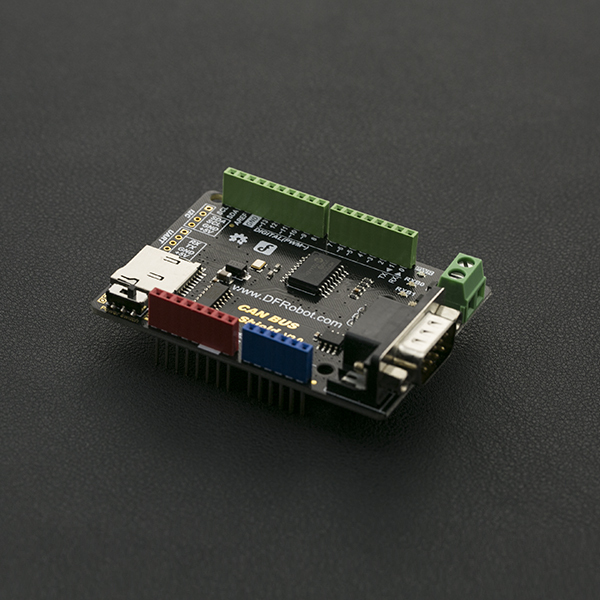 It is compatible with the Arduino standard interface and can be stacked on an Arduino UNO, arduino Leonardo or arduino MEGA board. The shield integrates an MCP2515 CAN-BUS chip on the shield and has a CAN-BUS transceiver function. With an on-board DB9 and CAN-BUS connector you can choose a suitable port according to your host device. There is also an integrated MicroSD socket for data storage - a perfect solution for data logging applications. The Arduino board can be powered from a 7V source, the switch should be "ON"
The Arduino board can be powered from the USB and DB9 simultaneously but if the Arduino board is powered by DC-Vin port, the power switch should be turned off to avoid damage to the shield and the board. 1. CAN-BUS Node (Device) What is CAN-BUS Node? The CAN-bus is a local area network control protocol. In a local area network there are multiple devices connected. Each device is called "Node". There is a CAN-bus protocol controller on each node (control chip). Refer to CAN-BUS WIKIPEDIA 2. 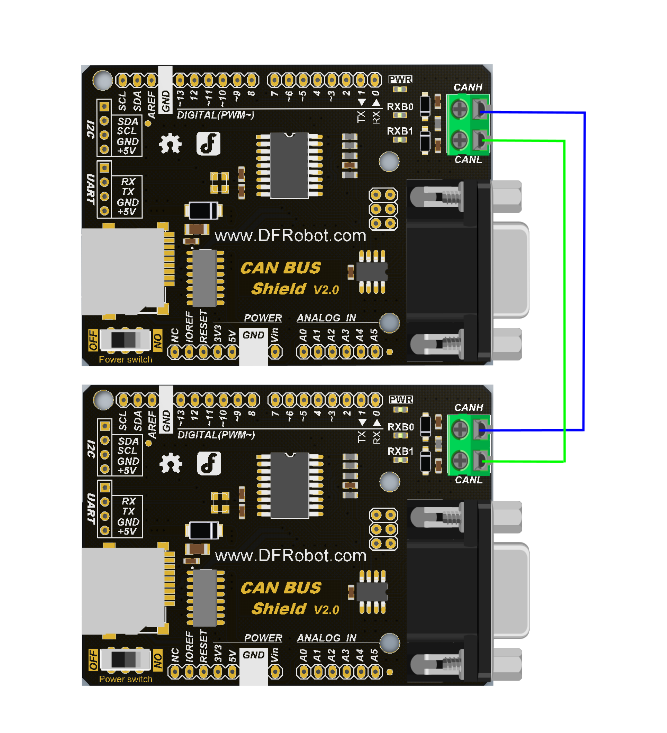 CAN-BUS nodes can be used as a data receiver or data transmitter. So we call the CAN-bus node a "transceiver" 3. There is no concept of "Address" in CAN-BUS protocol, instead each device is distinguished by an "ID". Every device has a special ID in the node. 4. The CAN-BUS node relies on its hardware proof function to implement a selective receipt of Data frame from special ID at initialization time. We can call the following command to configure the special ID: init_Mask(Masker_t Masker_num, INT8U ext, INT32U ulData) and init_Filter(Filter_t Filter_num, INT8U ext, INT32U Data) 5. The data sent by any node in the network can be selectively received by the other nodes. This node can also selectively receive data sent by other ones. The following is a simple scenario to demonstrate how it works: There are 5 nodes in the network; A, B, C, D and E. If Node B can only receive data from ID 0x06, when Node A wants to send "Hello world" to Node B, you can call sendMsgBuf(0x06, 0, 12, "hello world") function to implement this process. Meanwhile, what about the other nodes circumstance? Description: Constructor, specify the CAN-BUS Shield V1.0 SPI chip select pin. MCPCAN CAN(4); //Instantiate a Object with MCPCAN class, D4 is Arduino SPI CS pin. This function should be called at first, initialize CAN-BUS MCU. INT8U begin(INT8U speedset) Description: Initialize setting CAN-BUS buadrate, follow the init() function. speedset: Baudrate: CAN_5KBPS, CAN_10KBPS, CAN_20KBPS, CAN_31K25BPS, CAN_33KBPS, CAN_40KBPS, CAN_50KBPS, CAN_80KBPS, CAN_83K3BPS, CAN_95KBPS, CAN_100KBPS, CAN_125KBPS, CAN_200KBPS, CAN_250KBPS, CAN_500KBPS, CAN_1000KBPS. Return: If the initialization is successful, return "CAN_OK"; if initialization fails, return "CAN_FAILINIT". ext: "ext = 0", it is a standard frame; "ext = 1", it is an extended frame. Return: If success, returns "CAN_OK"; if timeout, returns "CAN_SENDMSGTIMEOUT"; If you fail to get the next free buffer, it returns "CAN_GETTXBFTIMEOUT". INT8U MCPCAN::setMsg(INT32U id, INT8U ext, INT8U len, INT8U rtr, INT8U *pData) Introduction: Send remote sending request message. rtr: "rtr = 1", it is a Remote sending request frame; "rtr = 0", it is a data frame. Masker_num: mask register name: MCP_RXM0、MCP_RXM1; If Masker_num = MCP_RXM0, initialize the mask register 0 (mask register 0 receives data from buffer0); if Masker_num = MCP_RXM1, initialize the mask register 1 (mask register 1 receives data from buffer1). ext: "ext=0", configure standard frame with mask register setting; "ext = 1", configure extended frame with mask register setting. Data: Write this data into mask register, to configure which register will be blocked. Returns: if success, returns "MCP_OK"; if fail, returns "MCP_FAIL"
init_Mask(MCP_RXM0, 0, 0x3ff); //follow the init() function, before the begin() one. Implement a standard filter frame from 0~9 bit, 10 bit in all, because the binary form of "0x3ff" is "11 1111 1111". INT8U checkReceive(void) Introduction: check the validity of received data frame. 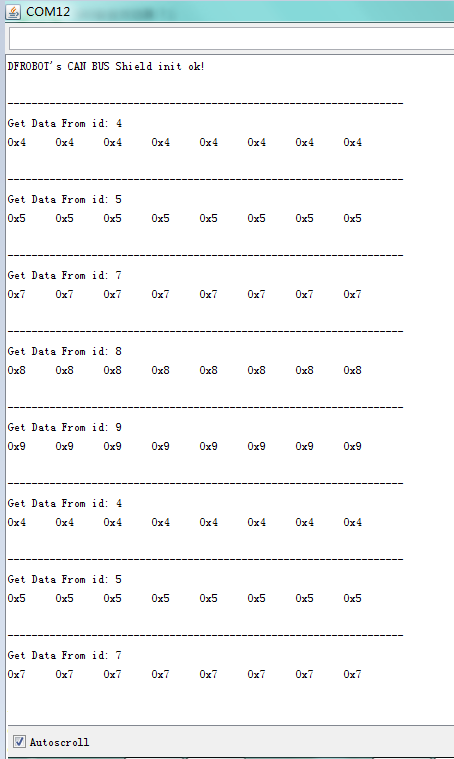 Check the validity of received data frame after CAN-BUS works. You can rotational call this function to detect it, refer to the following example. INT8U init_Filter(Filter_t Filter_num, INT8U ext, INT32U Data) Introduction: Initialize the message acceptance filter register. Filter_num: Message acceptance filter number, could be MCP_RXF0, MCP_RXF1, MCP_RXF2, MCP_RXF3, MCP_RXF4, MCP_RXF5. ext: if "ext=0", it means the message acceptance filter receive standard data frame message only; if "ext=1", it means the message acceptance filter receive extended data frame message only. Data: Filtered message ID. Only the data frame with filtered id can be received by CAN controller. So an upcoming data frame whether can be received depends the value in MCP_RXM0/MCP_RXM1 in init_Mask() function, the value in MCP_RXF0 registers in init_Filter() function and upcoming message identifier ID. These three value can be looked up on Table 4-2. If every true result is received, then the message will be received by the CAN controller. Otherwise, it will be discarded. If you configure MCP_RXM0 with 0x7ff with init_Mask(MCP_RXM0, 0, 0x7ff), it means it will mask the 11 bit of the standard frame. Meanwhile the init_Filter(MCP_RXF0, 0, 0x20) function will configure MCP_RXF0 register as 0x20 (000 0010 0000), filter with 0x7ff (111 1111 1111). if every value is true, the ID will be received. But if there is a false value, this ID will be discarded. In this case, MCP2515 can receive the message with ID 0x20 only. And you can also modify init_Mask(MCP_RXM0, 0, 0x7ff) to init_Mask(MCP_RXM0, 0, 0x7DF), it also support 0x20 ID. Return: "CAN_OK" means reading successfully; Contrarily, return "MCP_FA". init_Mask(MCP_RXM0, 0, 0x7ff); init_Filter(MCP_RXF0, 0, 0x04); //After init() function, before begin() function. Working withinit_Mask()function. Set 0x04 as CAN controller receiving ID. INT8U readMsgBuf(INT8U *len, INT8U *buf) Introduction: Read data from MCP2515 receiving buffer. Return: "CAN_OK" means reading successfully; Contrarily, return "CAN_NOMSG". INT8U readMsgBufID(INT32U *ID, INT8U *len, INT8U *buf) Introduction: Read data from MCP2515 receiving buffer and read this data frame ID. Return: "CAN_CTRLERROR" means it sends the control error; Contrarily, return "CAN_OK". You can get the data frame ID with this command, after you receive the data frame. Refer to the following examples. Introduction: Check whether it is a extended frame. This command is called in receiving interrupt handler function, to check whether the data frame is a standard data frame or an extended data frame. CAN-BUS Shield v2.0 Library About Library installation. In this section we will demonstrate basic CAN BUS receiving and sending functions. Receiving uses polling mode. You can accept any ID standard data frame or extended frame. The transmitting node sends a standard data frame which ID is 0x06 per 100ms. int count = 50;                                     // the max numbers of initializint the CAN-BUS, if initialize failed first!. CAN.init();   //must initialize the Can interface here! In this section we will test basic CAN BUS receiving and sending functions in this experiment, but will only receive data by interrupt mode. 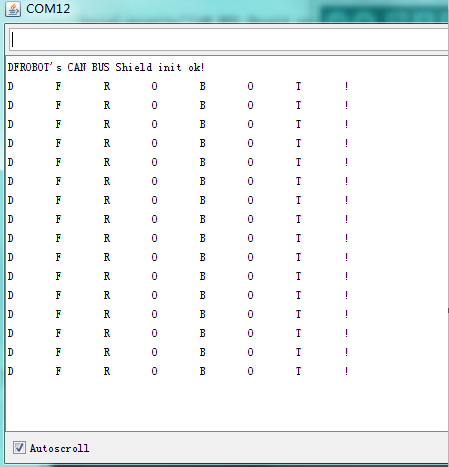 // message, MCU does  clear the corresponding IRQ conditon. This test is to specify the data frame of the ID when the CAN module is initialized. Data is received using interrupt mode. * // there are 6 filter in mcp2515,so it can filter six id,i.e.0x04~0x09. memset(data, id, sizeof(data));                 // set id to send data buff, id is arranged form 0x00 to 0x09. The received data frame has no data from ID 0x06,0x00,0x01 or 0x02 which not matched with the ID which is set by Data acceptance filter. This shows that the filter can be a single job, or a few filters working at the same time, or all of the filters working at the same time. When all filters are not in use then can receive any data. This tests all three modules on the network and the data transceiver situation. Each module of the three modules can be used as a receiver, and can also be used as a sender. 3 node devices are used in this experiment; node 1, node 2, node 3. Node 1 is used only as a receiving node, which can receive data frame which ID is 0x04, 0x05,0x07,0x08 and 0x09. Node 2 is used only to receive data frames form ID 0x09 and only send data form ID 0x08 which data frame is “node 2”. Node 3 only receives data frames form ID 0x08 and only send data form ID 0x09 which data frame is “node 3”. Output in the each serial port COM10 is running Node 3 code, which only receives the ID 0x08 data frame. COM12 is running Node 2 code, which only receives the ID 0x09 data frame. COM21 is running Node 1 code, which receives the ID 0x09 and 0x08 data frame. The purpose of this experimental is receiving node receives the ten data from the sending node.And then put it into the SD card.Finally read it from SD card out and print it out through the serial port. // with the frame id equeling 0x06. Experimental phenomenon analysis: the receiving node receives the data frame from ID 0x60, and deposits it in a file named Node0x60.text file. Then it closes the file. Finally, it opens the file, and reads the data and prints it through the serial port. 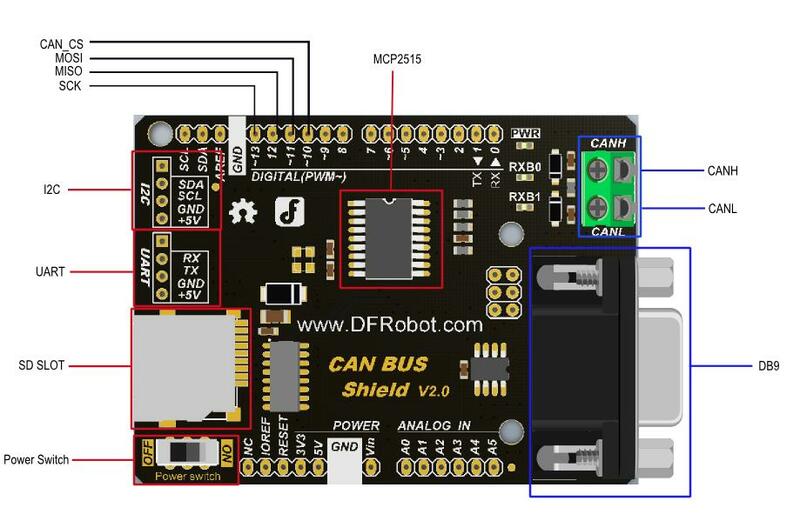 Get it from CAN BUS Shield For Arduino or DFRobot Distributor.